In this Japanese name, the family name is Endō. Akira Endo (遠藤 章, Endō Akira, born 14 November 1933) is a Japanese biochemist whose research into the relationship between fungi and cholesterol biosynthesis led to the development of statin drugs, which are some of the best-selling pharmaceuticals in history. 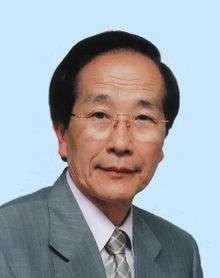 He was awarded the 22nd Japan Prize in 2006 and the Lasker Award in 2008. Endo was born on a farm in Northern Japan and had an interest in fungi even when young, being an admirer of Alexander Fleming. He obtained a BA at Tohoku University (Faculty of Agriculture) in Sendai in 1957 and a PhD in biochemistry at the same university in 1966. From 1957 to 1978 he worked as a research fellow at chemical company Sankyo Co.; initially he worked on fungal enzymes for processing fruit juice. Successful discoveries in this field gained him the credit to spend two years at the Albert Einstein College of Medicine as a research associate (1966-1968), working on cholesterol. His most important work in the 1970s was on fungal extrolites and their influence on cholesterol synthesis. He hypothesised that fungi used chemicals to ward off parasitic organisms by inhibiting cholesterol synthesis. The cell membranes of fungi contain ergosterol in place of cholesterol, allowing them to produce compounds that inhibit cholesterol. Endo studied 6,000 compounds, of which three extrolites from a Penicillium mold showed an effect. One of them, mevastatin, was the first member of the statin class of drugs. Soon after, lovastatin, the first commercial statin, was found in the Aspergillus mold. Although mevastatin never became an approved drug, the mevastatin derivative pravastatin did. He was an associate professor and later a full professor (1986-) at the Tokyo University of Agriculture and Technology between 1979 and 1997, and after his official retirement became the president of Biopharm Research Laboratories. Apart from the recognition, Endo never derived financial benefit from his discovery, despite the fact that statins are amongst the most widely prescribed medications. "The millions of people whose lives will be extended through statin therapy owe it all to Akira Endo," according to Michael S. Brown and Joseph Goldstein, who won the Nobel Prize for related work on cholesterol. 1 2 3 Landers, Peter (9 January 2006). "How One Scientist Intrigued by Molds Found First Statin". Wall Street Journal. ↑ Allen, Frederick. "The Inventors Hall of Fame Honors the Greatest Living Innovators". Retrieved May 12, 2014. ↑ landers, peter. "How one scientist intrigued by molds found first statin". WSJ. Retrieved May 12, 2014.